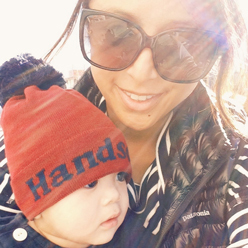 Check out the entire "Mom Style How To" Series! At the Autumn/Winter 2013/2014 Fashion Weeks in New York, London, Paris, and Milan, tony fashion editors and renowned style icons couldn't resist the navy and black trend gracing the runways of Calvin Klein, Jil Sander, Lanvin, Chloe, and Derek Lam. Now, "navy and black" is the trend our favorite fashion magazines, stylish celebs, and street style blogs are buzzing about. Mixing navy and black can be a little tricky. I like to add flavor to my navy and black ensemble with a little texture (a la this swiss dot shirt) or a dash of shine (gold buttons on a coat or studs on a shoe). Choosing your favorite navy/black print works, too! Using these elements creates more depth and pop to a look than a head-to-toe solid outfit. Oh, and in terms of makeup—this is a perfect opportunity to test drive that new fabulous orange lip color you saw on the red carpet! 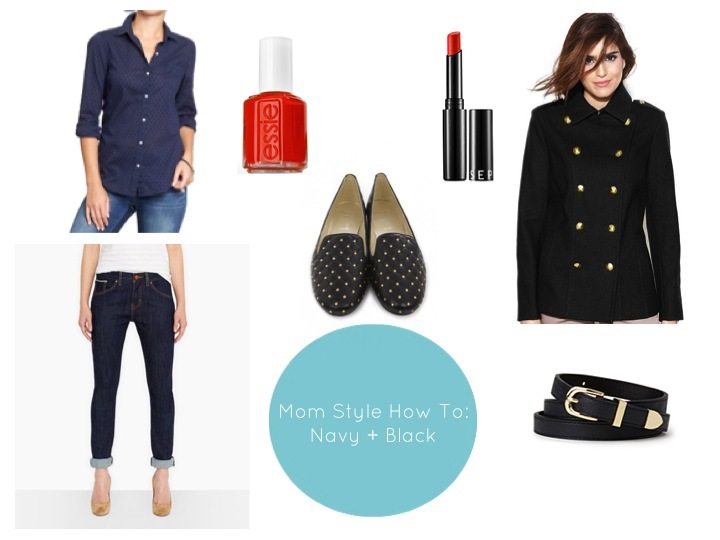 This is a navy-and-black-trend-inspired look that I'm excited to try this month. Texture, gold, and traffic-stopping makeup paired with my everyday mom staples (boyfriend skinny jeans & stylish flats) make me polished for a big client meeting and comfy when I'm rolling around on the rug with Baby T.